“How do we grow our individual giving? Worthy questions, right? After all, they came from you. But are they “beautiful” questions? 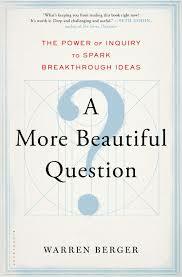 In his book, A More Beautiful Question: The Power of Inquiry to Spark Breakthrough Ideas, Warren Berger argues that one of the most powerful forces for igniting change is, no, not necessarily more information — after all, we’re bombarded with more information now than ever before — but the power of questioning. And he shares the inspiring story of Van Phillips. He’s the guy that invented the mind-blowing “blade runner” prosthetic device. When Phillips lost his leg in a boating accident, he could have asked the usual question. Why me? Instead he went further, asking “If they can put a man on the moon, why can’t they make a decent foot?” Then he took ownership of the question: How can I make a better foot? The rest is pretty much history. Let’s turn it around now. What are your “beautiful” questions? How can we know our donors on a deeper level? What do our alumni need to hear from us in order to feel genuinely appreciated? How can we surprise and delight our donors? What is the donor experience when they make a first time gift? How can we make it better? How can we empower our board members to be amazing fundraisers? Sometimes all your challenge needs is some reframing. A More Beautiful Question: The Power of Inquiry to Spark Breakthrough Ideas is a highly recommended read for nonprofit leaders.